To see if my installation is broken, I tried downloading 123 Free Solitaire, whch worked with no issues. I am running Linux Mint 19 Xfce, and wine-devel 3.18.0. So far I have tried uninstalling and reinstalling wine, using the stable instead of development branch, changing windows version in winecfg, and using winetricks. Any thoughts on what my issue could be? Thanks. I tried a version 1.17 exe from the wayback machine and got the same issue. Make sure you have the MS corefonts installed, either in the wineprefix or systemwide (bug 29045) and bind the process to one core (taskset -c O) when you run it (bug 35041). I installed ttf-mscorefonts-installer and used taskset -c 0, still the same error. 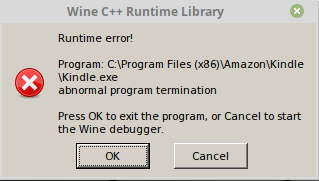 KindleForPC-installer-1.17.44183.exe installs fine here in Wine 3.18 and a clean wineprefix. Post terminal output from running that installer. Update on this: I uninstalled everything related to wine, reinstalled everything, created a new wineprefix, and it works just fine. My guess is that I made a mistake installing my 32-bit wineprefix before, but I don't know for sure. Thanks for your help.